With Legacy Home Inspections of Texas, you can rest easy knowing that you've chosen the right home inspector. We work exclusively for you, to serve your best interests and to arm you with the information you need. We hold ourselves to a high standard of ethics and professionalism to provide you with a comprehensive, unbiased report on the condition of your home. 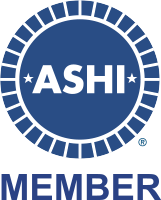 We're also a member of the American Society of Home Inspectors (ASHI), and adhere to their Standards of Practice and strict Code of Ethics.